Spending years in materials science in the tire and rubber industry, I have found large volumes of publications available on most performance aspect of cord properties (strength, elasticity, fatigue, adhesion), and when I run across something on twist I usually make a note of it. 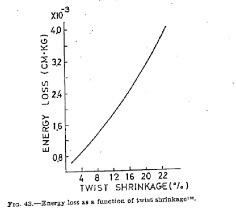 I have seen less published data and information available on the effect of twist level on textile cord properties. I have collected a few “rules of thumb” from Takeyama and Fujimoto. Recently at Hailide America Inc, we have looked at the twist effects in an industrial-grade high-tenacity polyester and have found the old tire-cord-twist rules of thumb that apply are actually inverted in the low twist region. These few rules of thumb I have found useful in trouble-shooting issues and enhancing performance aspects for various textile applications using tire cord. These are taken and paraphrased from what many in the industry affectionately call “The Tire Cord Bible”, Takeyama and Matsui in “Recent Developments with Tire Cords” Takeyama states “Generally speaking, as twist increases, cord strength, initial modulus, and fatigue resistance in cyclic tension decrease, while elongation at break, rupture energy, and fatigue resistance in compression increase”. I’ve gotten a lot of mileage and help from this one statement over the years in looking at trends and data. 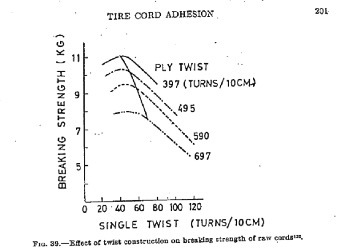 One thing to note, it is in reference to cabled tire cord, and I have noted below a range that seems reasonable from the industry; however, I have also seen these rules invert when studying low twist levels in other high strength textile cords not generally used in tires (twist level region is a critical point and discussed here). No matter the application and cord, it is always recommended to test the theory in the exact application and twist range intended in order to optimize construction for the intended application. 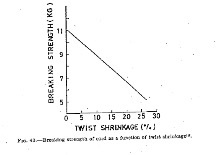 Figures below from Takeyama’s paper suggests an optimum twist level for breaking strength highly dependent on the ply cord construction. While the three figures below were studies in Rayon 1100d/2. In practice, the concepts are well known and applied to polyester and nylon as well. Note that in the first figure, the cabled twist tensile increases on the low twist end (opposite the tensile rule of thumb for tire cord). Thus it is helpful to look at a twist range to see what region applies, and if possible, understand approximately where the optimum tensile point is for the cord and construction studied. Recently Hailide has studied the effect of twist on 3000d HT/1 polyester at a much lower twist level than that typically seen in tire cord constructions. The 60z is clearly below the optimum tensile point. Hence, the tire cord property relationship rule to the twist is reversed in the low region. There can be significant effects on cord properties depending on the twist level and the region of operation. Take care in applying the “Rules of thumb” to cord material and construction, keeping in mind the tensile will go through an optimum peak for a given cord construction and geometry. Study a range a twist when possible, to locate optimum design for optimum product performance in the intended application. T. Takeyama and J. Matsui, “Recent developments with tire cords and cord-to-rubber bonding,” Rubber Chemistry and Technology, vol. 42, no. 1, pgs. 200-205, 1969. Need help determining the right yarn and twist level for your application? BS Chemical Engineering (85). Majority of career in Materials Development in the Rubber Industry, both tires and mechanical rubber goods. Until July 2011, served as a manager in Tire Reinforcement Development at the Bridgestone Firestone Technical Center in Akron Ohio. 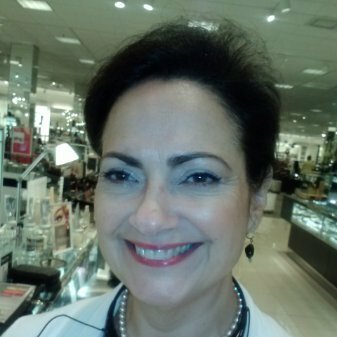 Shifted to Technical Sales in 2011 in the industrial fibers and fabric arena for Hailide America and more recently made Director of Technical and R&D for Hailide America, tailor making solutions to meet client needs in the Americas. Specialties: Technical, Sales, R&D Industrial fibers, R&D Strategy, Reinforcement Development process, Rubber Chemistry, FEM Heat Transfer, Rubber Compounder, Sealant Chemist, Process Development experience in Curing, Mixing, Extrusion, Calendering. Expert in Tire Reinforcement Materials and adhesive systems --> nylon, rayon, polyester, aramid, and steelcord and beadwire.